Every Sunday when we go to the farmers market I buy a HUGE fillet of salmon, from Marilyn, our beloved seafood purveyor. The second I get there I race to get in the long line of other farmers market goer’s who have been devouring her insanely good salmon for years. While I enjoy it as is with nothing more than a sprinkle of salt on it, this Summer Fruit Salad is a total game changer! It screams SUMMER from the very first bite. 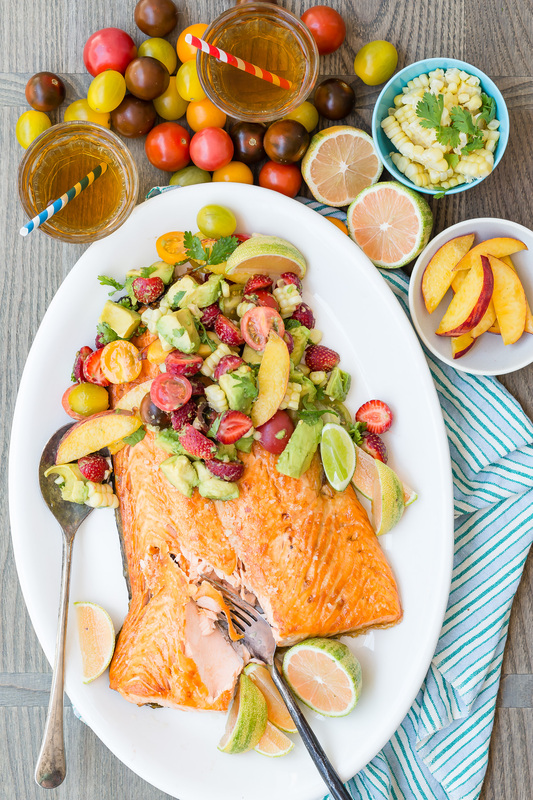 The first time I made this Broiled Salmon with Summer Fruit Salad we had friends over and they were so excited to try it. After all, there’s nothing more beautiful than bringing out a huge platter with a gorgeous piece of fish on it, but when you see the bright colors of the composed salad it’s jaw droppingly gorgeous. The best part comes when you take a bite, though. 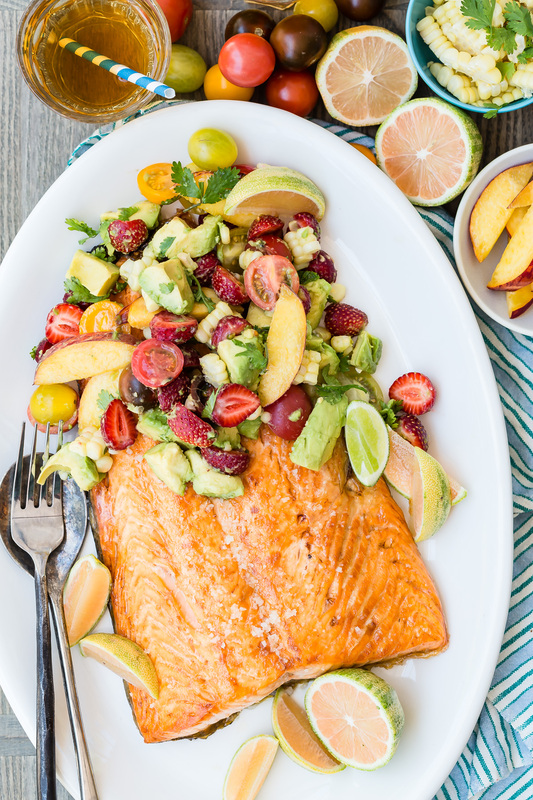 As much as I love eating a piece of salmon on it’s own, this summer fruit salad adds not only a ton of nutrition, but also a sweet, tangy and crunchy note to each and every bite. 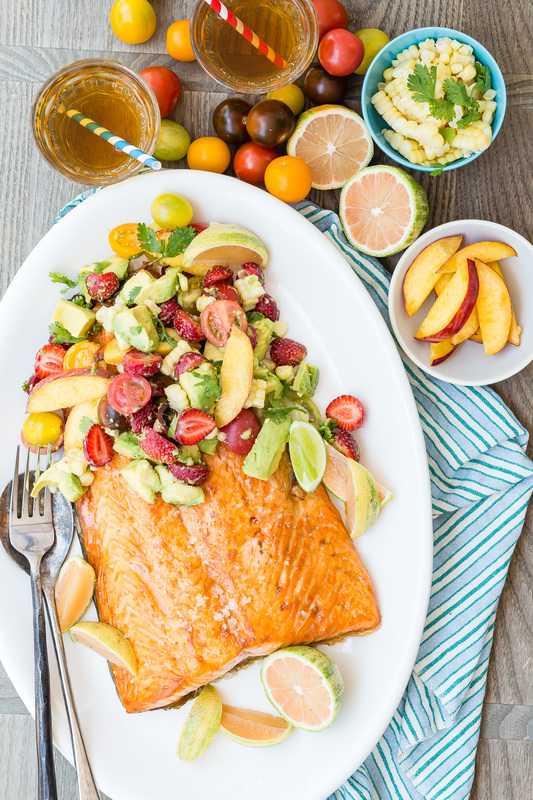 If you’re looking for a total crowd pleasing recipe this summer you must try Broiled Salmon with Summer Fruit Salad. It’s the easiest recipe to whip up and a total game changer. 1. Preheat broiler. Place salmon on a foil lined baking sheet, season with salt and pepper and broil 8-10 minutes or until golden. 2. In the meantime, place the remaining ingredients in a medium sized bowl and toss to combine. Season with a pinch of salt. 3. 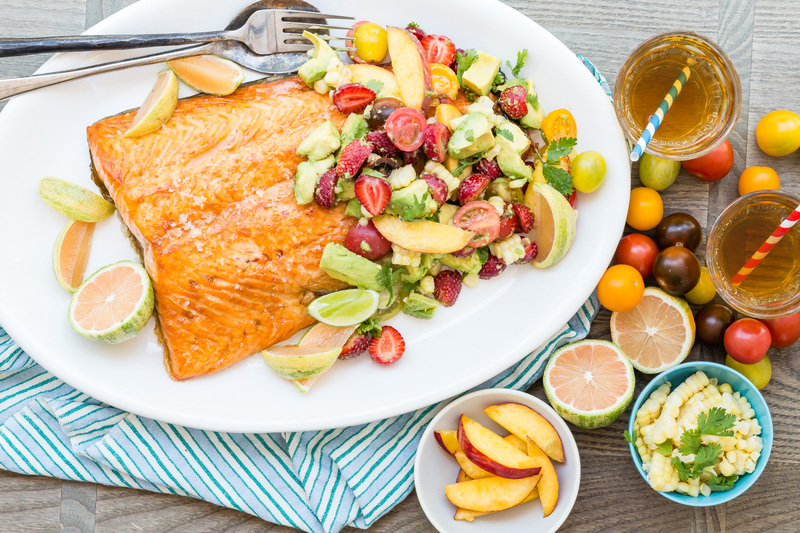 Place the salmon on a plate or platter and top with the summer fruit salad. This sounds absolutely delightful -- but I especially appreciate your description of getting this special salmon each week. Aww thank you! I really do love our farmer's market fish ladies! Do you cook the corn? I have a friend who recently told me she uses uncooked corn sometimes. I always thought it had to be cooked. Who knew?! Sometimes. Depends on the quality and freshness of the corn! You totally can leave it raw and eat it as is! How much longer would I need to broil the salmon if my filet is frozen? Thank you!! This was absolutely delicious! The whole family loved it! heal from broken heart" I wish I could find the right words to say how thankful i am to this love spell caster called Dr.Unity,I'm so excited my broken Marriage has been restored my husband is back after he left me and our 3 kids for another woman..After 12years of marriage, me and my husband has been into one quarrel or the other until he finally left me and moved to California to be with another woman. I felt my life was over and my kids thought they would never see their father again. i tried to be strong just for the kids but i could not control the pains that torments my heart, my heart was filled with sorrows and pains because i was really in love with my husband. Every day and night i think of him and always wish he would come back to me, I was really upset and i needed help, so i searched for help online and I came across a website that suggested that Dr Unity can help get ex back fast. So, I felt I should give him a try. I contacted him and he told me what to do and i did it then he did a Love spell for me. 28 hours later, my husband really called me and told me that he miss me and the kids so much, So Amazing!! So that was how he came back that same day,with lots of love and joy,and he apologized for his mistake,and for the pain he caused me and the kids. Then from that day,our Marriage was now stronger than how it were before, All thanks to Dr Unity. he is so powerful and i decided to share my story on the internet that Dr.Unity is real and powerful spell caster who i will always pray to live long to help his children in the time of trouble, if you are here and you need love spell to get ex lover back forever or save your marriage fast. Do not cry anymore, contact this powerful spell caster now. Here’s his contact:Call/WhatsApp: +2348071622464 ,Email: [email protected] ,Website:https://unityspelltempleblog.wordpress.com,your kindness will never be forgotten!. Revealed by Olivia Stephen form Tx,USA.